GSG is in the process of moving in for the week. It's a frantic, hectic pace to move ALL these machines in such a short time, but by opening day, March 3, it will look like they have been settled into place for weeks. Once you're here, take your time and enjoy the show - the frantic work will be behind us, and GSG will be eager to share some time with you. 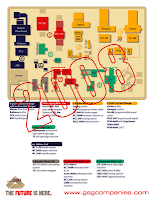 There is a lot of new equipment to become aquainted with, but you can be sure that the "not so new" faces in the GSG booth will be glad to walk through it with you. 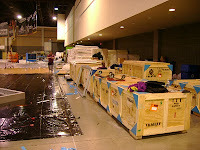 See you at the show - remember, Booth 2625. PS - pack a coat, it's been chilly in Charlotte thus far! 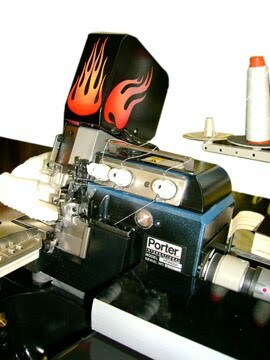 Porter Internatinal has the fastest, most powerful flanger in the world: the PFM-4000 flange machine. The awesome flanging capabilities are usually enough to make it stand out in a crowd, but we felt a machine like this deserved a paint job more fitting of it's hot rod performance. It is the muscle car of flange machines and you can see it run LIVE at Booth 2625 at ISPA EXPO! Strip all critical parts off the machine and start with the core housing parts. We gave ours a metallic chrome undercoat, so highlight edges would really shine. Finally a solid black layer was applied, careful not to spray too far into the areas reserved for the black-blue-chrome fade. First, paint undercoat layers of yellows, reds and oranges. Keep in mind where you intend your flame patterns to end up. Apply a precut vinyl stencil and then cover the surface with black paint. This protects your flame colored oranges and reds from the black paint. Once you have adequate layers of black paint, peel off the flame stencils after the black paint dries. Finally give all parts a protective clear coat and assemble your extreme machine! OK, that was fun, but there is a more productive way to improve a flanger: couple it with a motorized belt table. Porter has already thought of that - it's called the EST-4000. 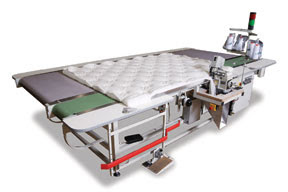 See it here, and see other great mattress machines at GSG booth 2625 at ISPA EXPO. Attendance at Las Vegas Market on a pace to exceed last year's winter event: "LAS VEGAS — World Market Center officials said Tuesday that attendanc..."
Strengthening attendance is the good news from Las Vegas (courtesy of FurnitureToday). Retailers are anxious to see how they can improve upon a dismal 2009 and they are eager to find a solution. 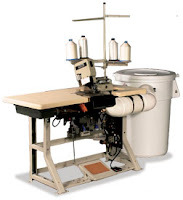 Read more about the Las Vegas Market at FurnitureToday, and read more about top value mattress machinery necessary to meet retailer needs at http://www.gsgcompanies.com/. 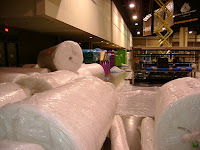 Be prepared for renewed retailer demand by seeing the most recent advancements in mattress machinery at ISPA EXPO 2010, and GSG Booth 2625 is the place to find it.